The Williamsburgh Savings Bank in background of the rising stadium. 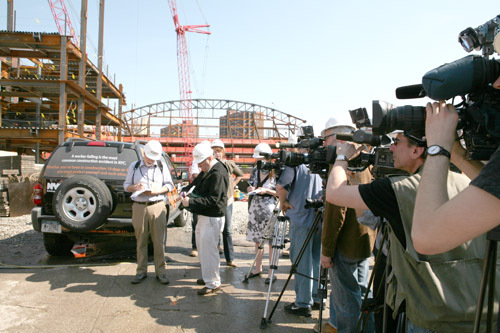 Press jam at Atlantic Yards. 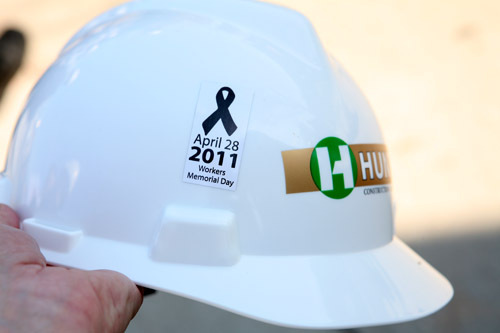 Helmet sticker for Workers Memorial Day, April 28. DOB’s Acting First Deputy Commissioner Thomas Fariello said they chose the site for the safety-themed event because DOB wanted to highlight “the guys that are doing it right.” He added they wanted to get the message out to some of the old timers who have been on the job for 20 to 30 years. “We’re trying to report any incident that happens on a site,” he said. “It doesn’t matter if its union or non union.” To that end, thousands of campaign posters will be distributed to sites throughout the city translated into Russian, Chinese, Spanish, and Polish. Also on hand was Linda Chiarelli, deputy director of construction for Forest City Ratner. She stopped by to check on progress and talked about the rusted steel curtain wall designed by SHoP Architects. 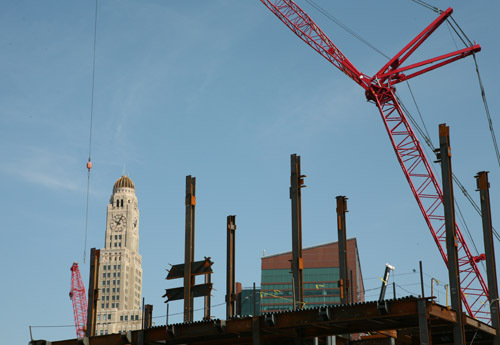 Chiarelli was on her way to Indianapolis, where the steel panels are being produced, then shipped to New York as assembled units and fastened to the building frame. She said they hope to have a mock-up unit two blocks away within two months. She described the appearance of the wet and dry cycle machine being used to accelerate panel rust as looking like “a giant dry cleaning machine.” With over 11,000 distinct panels to process, one hopes they don’t lose any tickets.